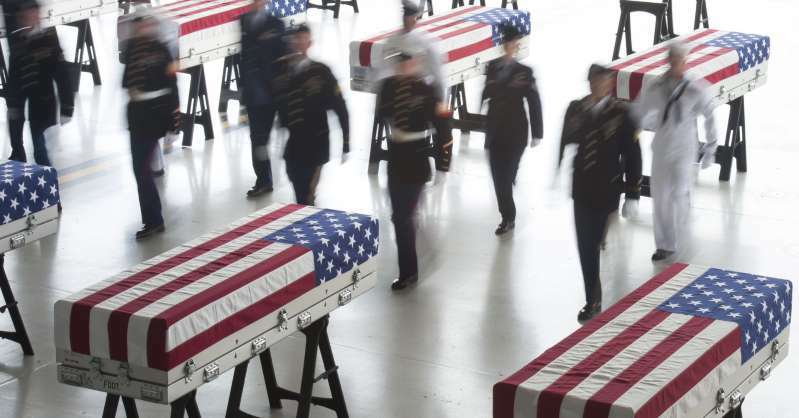 Pentagon officials reaffirmed Tuesday its commitment to identify the recently transferred remains believed to be those of U.S. soldiers killed in the Korean War, despite the "moderate to poor" condition in which they were received. Nearly three weeks ago, the North Korean government handed over what they claim are American remains in 55 boxes. The boxes, draped in United Nations flags, were then flown from the Korean Peninsula to a military laboratory in Hawaii for analysis and identification. [post_ads]"Our laboratories, both DNA and forensic laboratories, have the technology and the capabilities by which to differentiate those remains over the course of the next several years," Kelly McKeague, director of the Defense POW/MIA Accounting Agency, or DPAA, said Tuesday during a White House briefing. The repatriated remains mark the first tangible results to come from June's historic summit between President Donald Trump and North Korean leader Kim Jong Un. On the ground to verify the transition of the remains was Dr. John Byrd who heads the analysis effort for the DPAA, the Pentagon unit tasked with identifying the remains. "The North Korean officials that we spoke to were very forthcoming and candid with us and a couple of things they told us was that these were remains believed to be American and from the Korean War," Byrd told reporters at the Pentagon earlier this month. "They also, though, were clear with us that they couldn't be sure how many individuals were represented in each box," Byrd added. Byrd noted that each box was accompanied with a paragraph of text in Korean that included information such as dates and geographical locations. During Byrd's preliminary assessment he found the remains were "consistent" with being those of American and from the Korean War. Meanwhile, Trump thanked the reclusive leader from the North via Twitter for the return of the remains. "Thank you to Chairman Kim Jong Un for keeping your word & starting the process of sending home the remains of our great and beloved missing fallen," Trump tweeted. Byrd explained that the process for identifying the remains could take months or a few years depending on their condition. "If we have teeth, especially teeth with dental restorations, we will be immediately begin comparing those to dental records," he said noting that his team of scientists will be able to run searches against a well-built database. Byrd added that the next step in this process is for all the remains to undergo DNA testing in the coming weeks.